In my mind, Google TV is about the most interesting product idea in recent gadget history. It’s poised, ready, not to disrupt the TV industry, but rather provide consumers true on-demand options with no extra work on the networks’ part. There’s nothing particularly novel about Google TV, but the whole concept is wrapped up as such a nice package that’s it’s hard not to like it — that is, if you can look past the first generation jitters. The platform isn’t particularly ready for general consumption just yet as it seems it fell victim Google’s “release early, release often” mantra. But it’s only going to get better with each release. I spent some time this afternoon talking to Google TV’s product managers, Salahuddin Choudhary, about what’s wrong with the platform today and where it’s going. Let’s just say my interest was restored. Google TV will live up to its potential. John and I worked on several of CrunchGear’s Google TV posts together as we both have units installed at our homes. We both noted that the Chrome browser seems stripped down, almost unusable for general web browsing. This was by design. Apparently Google found from various focus groups that people preferred the full-screen experience rather than having a browser on their HDTV that showed the URL bar, tabs, and all the rest standard on a desktop browser. The primary purpose of Google TV’s browser is to watch videos, not peruse Facebook or Amazon. This might change, though. Salahuddin commented that they are working on making “the core browser tools more accessible.” after I droned on and on about how it’s a missed opportunity to at least not have those user elements be optional. I wasn’t the only one that had a hard time finding the URL bar. (it doubles as the search bar) They seem to understand user experience is key but I’m not sure it’s a top priority like it should be, a criticism that applies to the Android Marketplace as well. I stated in our review that Google TV seems half-baked. That’s particularly true when it’s noted that apps won’t hit the system until 2011. 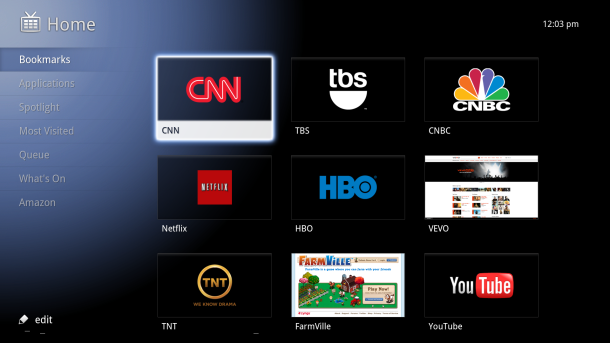 But sometime next year, the entire Android Marketplace will appear on Google TV. Yeah, all the apps are coming to the Google TV platform: Angry Birds, Google Earth, Robo Defense. They’re committed, for better or worse, to support the entire back catalog. If you thought an iPhone app looks horrible upscaled to 2x on the iPad, just wait until the Android port hits your 50-inch LCD. Of course I was assured that they are working on the scaling and they might look fine, but smartphone apps are fundamentally different than Google TV apps. I’m expecting a lot of disappointed GTV owners once the Android Marketplace hits the platform and they install their favorite Android smartphone apps. But there’s going to be another sort of Android app. One designed just for Google TV and a “full range of developers” are already on board. The few apps of Pandora, NBA Gametime, Netflix are really just a proof of concept. They were included to show what Google TV could do, but I would argue that they added to the half-baked taste. Besides Netflix and Pandora, the rest are officially meh. We talked briefly about the content provider’s stance and blocking of Google TV, but there was no hint of concern or worry like I expected. Google TV is looked upon internally as a product that works with cable, not against it. 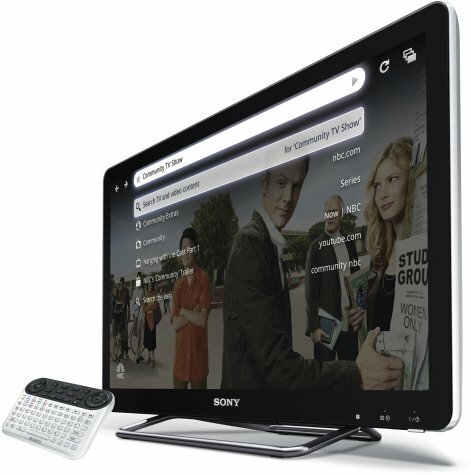 Video web portals like Hulu are just one source of content for Google TV. It also links up with Amazon VOD and Netflix, which, while they’re pay sites, do offer a fairly extensive library of content that’s free from ads. “It’s up the networks,” Salahuddin said when asked about the blocking situation. While writing our comprehensive Google TV review, I couldn’t help but feel that the system could be a game-changer, but only if given enough time. I worried that Google wouldn’t give the platform time to mature, but those fears were somewhat subdued knowing that Sony dumped a good deal of money into developing and marketing two major products. They would keep Google on track, I thought. But after talking to Salahuddin, I feel my original fears were unfounded. Google is in this for the long haul. Google TV will be given the time it needs to grow into a consumer platform. Oh, and my final question of “Is Google TV coming to the PS3?” was met with a surprised chuckle and quick “no comment.” So yeah, Google TV is coming to the PS3. Somehow. Maybe. I really don’t know. Revisions: Inserted the proper name of the product manager.